You can submit your ideas here. 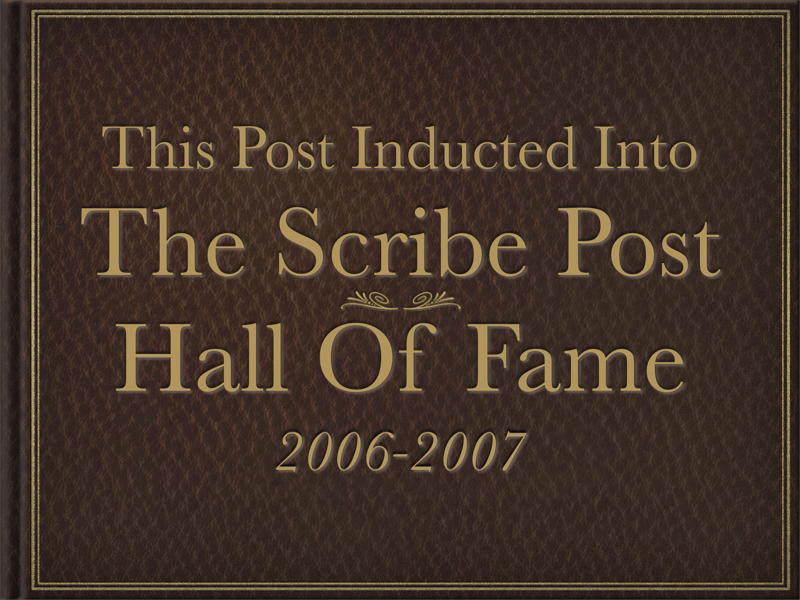 I've just done some reorganizing of The Scribe Post Hall Of Fame Wiki. 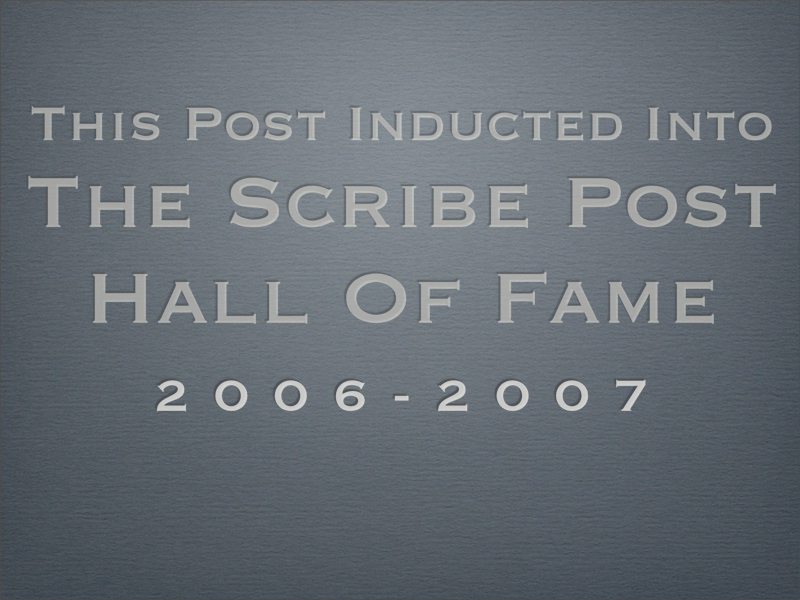 I've archived last year's Hall of Famers and have two inductees already for the new school year. I know there are some other teachers out there using scribes in their classes. I hope you'll tell them about the Hall Of Fame, add yourself as a contributor (including of an email link is optional) and start inducting each other's students into this year's Hall Of Fame. Last year I had talked about designing a badge for the inductees. I've designed two different badges, available in two different sizes. I've already pasted one into one of my student's posts. Mind you, so many of them are doing such great work so early on in the semester, I expect to see a prolifferation of Hall Of Fame inductees. I've been exploring YouTube. At a suggestion from my wife I looked up this video clip from "Good Night and Good Luck;" George Clooney's film about Edward R. Murrow. In this closing speech he's talking about the television .... if he were alive today, amidst all the talk about things like MySpace, might he give the exact same speech ... about the computer? Having been away from the blog for the better part of the summer I came across Karl Fisch's Did you know? post last weekend. Like everyone else, I was completely blown away. Karl put a very generous copyright on his work. On Monday and Tuesday I downloaded the powerpoint and mp3 files and started remixing Karl's work. Just a little bit. I took out reference to Karl's school, added a reference to mine and some Winnipeg and Canadian content. We had a class discussion afterwards. Mostly, they were very quiet. I posted about it to their blogs and they have been reacting in the comments ever since. Just this morning I finally posted a link to the video. You can see it, and my student's reactions on their blogs: Pre-Cal 30S (Fall '06), Pre-Cal 40S (Fall '06) (this blog had a "bug." It was deleted and rebuilt. The 10 comments left by students beforehand were preserved and reposted as a single long comment by myself. Authour's names were preserved), AP Calculus AB (2006-2007). I feel there are a number of lessons to be learned from Karl's presentation. The most important of which is: To be successful in the very near future will require that everyone become life long learners. What students should take from school is learning how to learn. »In PowerPoint, save as a movie. »Edited the movie to match the length of the mp3 file; cut "seconds" from individual slides. It seems that the movie gives a greater amount of time for each slide than was in the original PowerPoint file. »Export as an mp4 file. I wanted to share what I learned. It also occured to me that this might be a good way to create presentations for K12 Online 2006 -- create slides in PowerPower and use something like Audacity to create the mp3 file. We had hoped to have the conference blog up by this weekend. Right now it looks like we should have it operational by Monday or Tuesday -- no promises but we're working hard on it. We'll also make badges for your blog available at that time. Bud and I got together on Friday September 1 to do what we hope will be the first in a series of podcasts for this new school year. We talked about how our use of blogs and other online social tools is evolving and what our plans are for the new school year -- it's our Back To School Podcast. We talked for about 45 minutes and had a good time bouncing ideas off each other. Give it a listen and add your ideas into the mix. Announcing the first annual "K12 Online 2006" convention for teachers, administrators and educators around the world interested in the use of Web 2.0 tools in classrooms and professional practice. This year's conference is scheduled to be held over two weeks, Oct. 23-27 and Oct. 30- Nov. 3 with the theme "Unleashing the Potential." A call for proposals is below. There will be four "conference strands"-- two each week. Two presentations will be published in each strand each day, Monday - Friday, so four new presentations will be available each day over the course of the two-weeks. Each presentation will be given in podcast or screencast format and released via the conference blog (coming real soon now; give it a day or two ;-) ) and archived for posterity. These presentations will focus on the practical pedagogical uses of online social tools (Web 2.0) giving concrete examples of how teachers are using the tools in their classes. They will also show how teachers plan for using these tools in the delivery of their curricular objectives. Basic training is "how to" information on tool use in an educational setting, especially for newcomers. Advanced training is for teachers who have already started using Web 2.0 tools in their classes and are looking for: (a) advanced technology training (eg. how to write your own blog template or hack existing ones), (b) new tools they can make use of in their classes, (c) teaching ideas on how to mash tools together to create "something new," (d) a pedagogical understanding of how technologies such as Weblogs, wikis, podcasts, social bookmarking sites, RSS feeds and others can deepen learning and increase student achievement, or (e) use of assessment tools to measure the effectiveness of Read/Write Web technologies in their personal practice and with their students. Tips, ideas and resources on how to orchestrate your own professional development online; the tools that support Professional Learning Environments (PLEs); how to create opportunities to bring these technologies to the larger school community; how to effectively incorporate the tools into your personal or professional practice; or how to create a supportive, reflective virtual professional community around school-based goals. Tips, ideas and resources on how to deal with issues like: lack of access to tools/computers, filtering, parental/district concerns for online safety, and other IT concerns while trying to focus on best practice in the use of Web 2.0 tools. David Warlick is a 30 year educator, author, blogger, and Web 2.0 programmer. Since 1981, he has been using information and communication technologies to help people learn, young and old. When his school could not afford any software for it's computers, he taught himself to program and wrote award-winning instructional games, before computers could even display in color. His blog posting are read around the world, and his free online web tools are accessed millions of times a week. At heart, David Warlick is a teacher, with a contagious passion and enthusiasm for helping people discover a brand new world of teaching and learning. David blogs at http://2cents.davidwarlick.com and podcasts at http://connectlearning.davidwarlick.com. Bud Hunt teaches high school language arts and journalism at Olde Columbine High School in Longmont, Colorado. He is a teacher-consultant with and the Tech Liaison for the Colorado State University Writing Project, an affiliate of the National Writing Project, a group working to improve the teaching of writing in schools via regular and meaningful professional development. Bud is also the co-editor of the New Voices column of English Journal, a publication of the National Council of Teachers of English. A consumer of copious amounts of New Media, Bud blogs and podcasts about his practice and larger educational issues at http://www.budtheteacher.com. Alan Levine is the Director of Member & Technology Resources for the New Media Consortium (NMC, http://www.nmc.org/ ). Before this, he spent 14 years evangelizing technology for the Maricopa Community Colleges, where he first hoisted a web server back in 1993 on a Mac SE/30. While at Maricopa, Alan was a key contributor to significant efforts such as Ocotillo, a faculty-led initiative that promotes innovation and drives change, created the Maricopa Learning eXchange (MLX), a virtual warehouse of innovation that pioneered the use of RSS in syndicating learning object content, and developed Feed2JS, an open source software shared for allowing people to easily incorportate RSS content into web pages. Alan works from home in Phoenix, Arizona and publishes his work on CogDogBlog (http://cogdogblog.com/). Anne is known for seeing the educational possibilities in the use of weblogs with students in classrooms, having implemented wonderful ideas and weblog projects with students and teachers in K-12 classrooms and at the university level. She currently works at Georgia State University in the Instructional Technology Center in the College of Education as an Information Systems Training Specialist. Her weblog, EduBlog Insights is a co-winner of the Best Teacher Blog in the second international Edublog Awards, a web based event that recognizes the many diverse and imaginative ways in which weblogs are being used within education. Darren Kuropatwa is currently Department Head of Mathematics at Daniel McIntyre Collegiate Institute in Winnipeg, Manitoba, Canada. He is known internationally for his ability to weave the use of online social tools meaningfully and concretely into his pedagogical practice and for "child safe" blogging practices. He has more than 20 years experience in both formal and informal education and 13 years experience in team building and leadership training. Darren has been facilitating workshops for educators in groups of 4 to 300 for the last 10 years. Darren's professional blog is called A Difference (http://adifference.blogspot.com). Sheryl is a technology/education consultant for the National Education Association (NEA), the Center for Teaching Quality, SRI International, the Virginia Community College System, the Virginia Department of Education, the Miami-Dade Public Schools, the Alabama Best Practices Center and adjunct instructor in the School of Education at The College of William and Mary. She has had several journal articles and book chapters published, been featured on public broadcasting television and radio shows, and is a regular presenter at local, state, and national conferences speaking on topics of homelessness, teacher leadership, virtual community building, and 21st Century learning initiatives. Sheryl blogs at 21st Century Collaborative (http://21stcenturylearning.typepad.com/blog/). Will Richardson is known internationally for his work with educators and students to understand and implement instructional technologies and, more specifically, the tools of the Read/Write Web into their schools, classrooms and communities. A public school educator for 22 years, Will's own Weblog (Weblogg-ed.com) is a primary resource for the creation and implementation of Weblog technologies on the K-12 level and is a leading voice for school reform in the context of the fundamental changes these new technologies are bringing to all aspects of life. Will is the critically acclaimed authour of the best-selling book Blogs, Wikis, Podcasts and Other Powerful Tools for Classrooms (March 2006, Corwin Press). Wesley Fryer is an educator, author, digital storyteller and change agent. With respect to school change, he describes himself as a "catalyst for creative educational engagement." His blog, “Moving at the Speed of Creativity” was selected as the 2006 “Best Learning Theory Blog” by eSchoolnews and Discovery Education. He is the Director of Education Advocacy (PK-20) for AT&T in the state of Oklahoma.